Published Mar 18, 2013 by Que. Part of the LiveLessons series. Office 2013 LiveLessons covers the basics of Microsoft’s latest release of the Office productivity suite, including Word, Excel, PowerPoint, Outlook, Access, and more! • Start-to-finish personal training on Office 2013: just watch and learn! 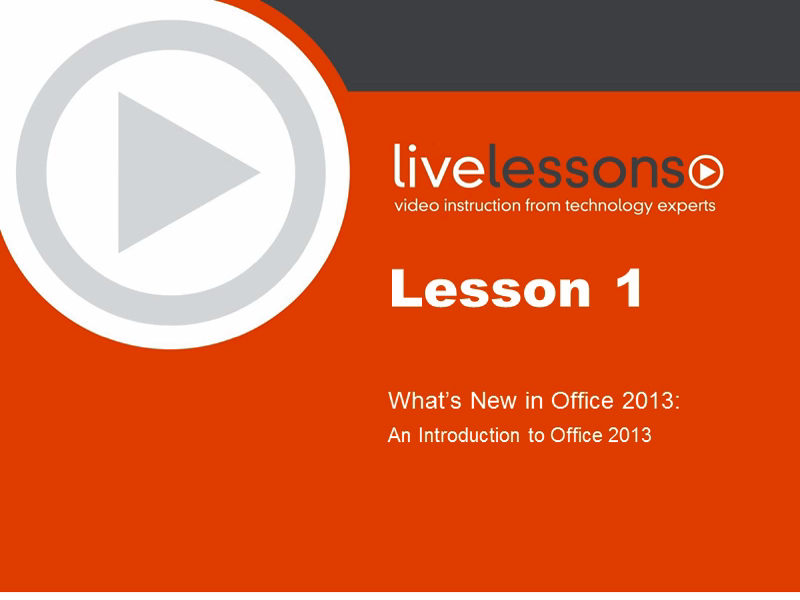 Office 2013 LiveLessons presents three hours of personalized Office 2013 training - quick, bite-size video lessons that teach virtually the basic skills for the applications of Office 2013. You can build your skills one step at a time, by simply watching these polished, upbeat videos. Begin by touring the new features of Word 2013, then dive into Excel 2013 and pick up a few tips like Flash Fill and Pivot Tables. Continue on to PowerPoint, Outlook, access and others at your convenience. These quick, self-contained lessons teach you key skills at your own pace - often in as little as two minutes. Every lesson begins with well-defined learning objectives, and ends with easy-to-understand summaries that help you track your progress.